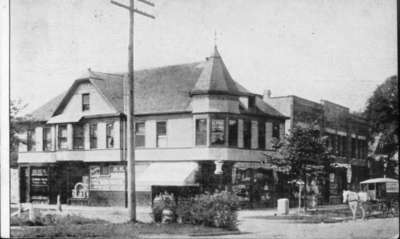 Postcard shows a view of the Wilmette Pharmacy at the southwest corner of the intersection of Green Bay Road and Wilmette Avenue. A horse and buggy stands on Wilmette Avenue. The card is an advertisement for the pharmacy, H. K. Snider, proprietor. Card is addressed on the reverse to Mrs. Herbert Mulford, 931 Twelfth [12th] St.